Grapes are great, but I like 'em fresh and firm. The moment they start to mush out, I lose interest, and let them languish in my crisper until they're "bad enough" to toss. This terrible cycle has since been broken, however, as I have discovered roasted grapes. Rather than toss the sad little things, I've started roasting them into jammy little morsels, perfect for pairing with cheeses. It's important that you understand that these are not raisins. While raisins are a concentrated form of grapes, they lack the wonderful rich and roasty flavours that come about from non-enzymatic browning in the oven. 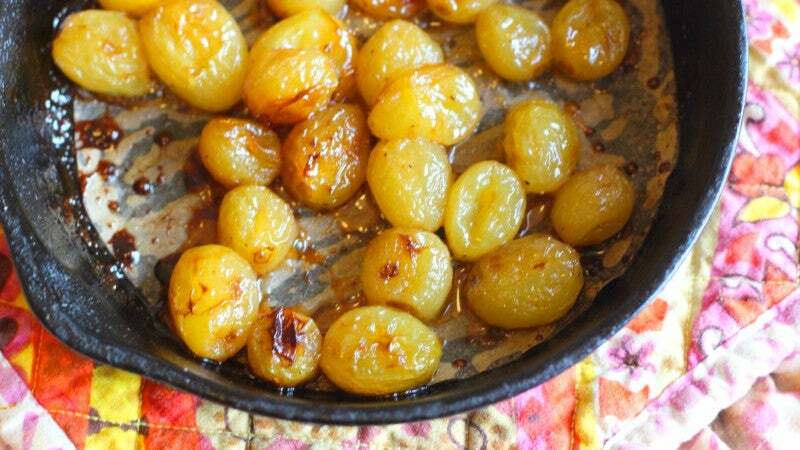 This browning keeps the syrupy grapes from becoming too cloying, and renders them downright addicting. 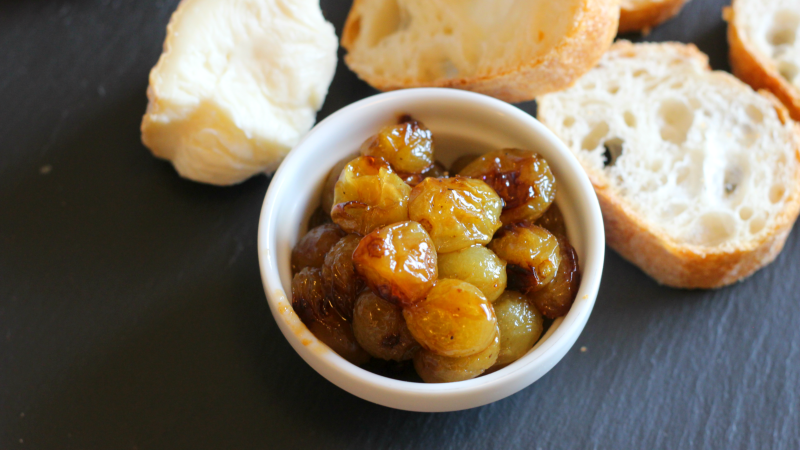 All you need to transform sad and mushy grapes into this fancy cheese plate friend is a little bit of oil (butter or olive oil both work), salt and pepper. 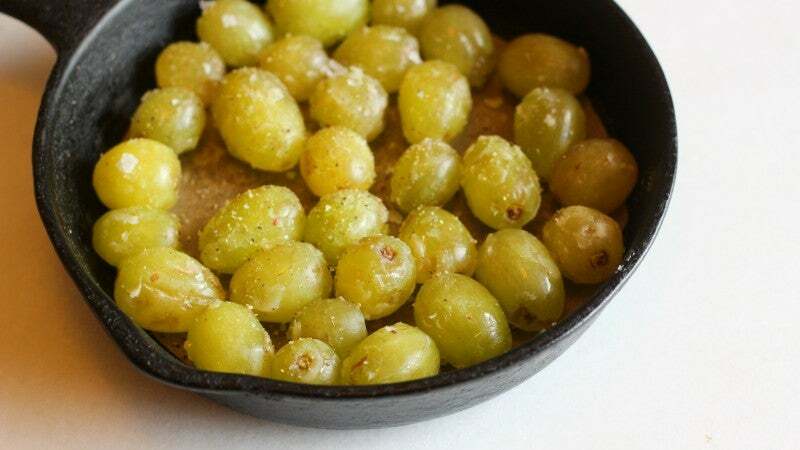 If, like me, you're a big fan of butter, just melt a couple of teaspoons and drizzle them on a whole mess of grapes, tossing and adding more if needed to make sure they all get lightly coated. Sprinkle on a little salt, grind on a bit of pepper, and pop them in a 220C oven for half an hour. The cooking vessel doesn't really matter. I like to use my tiny little cast iron pan, but a rimmed baking sheet, little casserole dish, or any other oven safe dish will work. 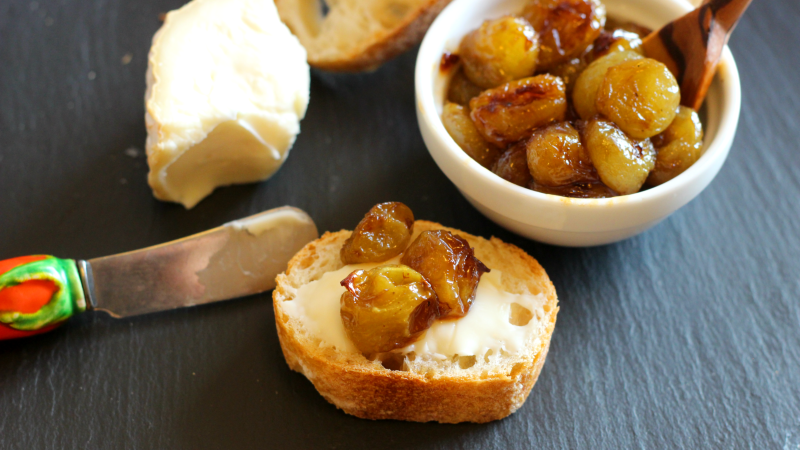 Once the grapes have burst and their delicious juices have condensed into a syrup, remove them from the oven, let them cool a bit, and serve them along your finest cheeses. Then go out and buy more fresh grapes and repeat the whole process as needed.